We are the company that focuses on innovative online games, whilst always staying with our core value: gameplay first. By letting our developers freely create what they believe in, we strive towards a unique and incredible gaming experience. Our goal is to create with passion, and have fun doing it. We believe that, only then, we are able to create truly innovative and extraordinary games. 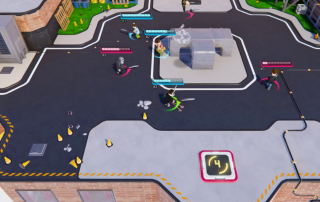 Fight World is a goofy (up to) 4v4 online brawler & platforming game focused on a unique weapon controlling system. Choose your weapon, customize your character and fight with your friends in different environments and tons of gamemodes like deathmatch, capture zone, football & race. It will be available first on PC, with plans to release it on Xbox & Playstation 4. Rekt Games was founded in 2017 with the ambition to make innovative games in the small town of Örebro in Sweden. Today, we’re a small group of 6, ranging from successful multientrepreneurs to award winning game developers. If you wish to contact us, our information is listed all the way down on all pages. View our lastest blog post below. You can also choose to click the red button to view all our blog posts. Right now, we’re looking for a game developer / gameplay programmer! Click on the button below for more information.